We’ve had such a wonderful 2018, and so many wonderful things have happened I wouldn’t have ever dreamed of. As well as looking back on all the great memories we have made throughout the year I also think about my favourite products we discovered during 2018. I’ve moved my collar and lead addiction over to Dog Beds, more expensive and unfortunately take up more room but I just love them! I’ve been admiring Ivy & Duke‘s dog beds for quite some time; so in their Black Friday Sales I just couldn’t resist. Some of our circular dog beds had floppy sides even though they weren’t too old, and my dogs like to be able to rest their chins on the side. So I went for a Waterproof Den bed in Grey. The sizes looked very generous so I went for the smallest and it is a perfect Spaniel size! They curl up in a ball and look so snuggly. When they go off to bed there’s actually now a race to the Ivy & Duke bed, fighting over who gets it. Then once they’re in there’s no way they’re getting out just in case the other one steals it, it’s so funny to watch! Unlike other beds I’ve bought that are similar the base is so thick, the solid memory foam pad makes me relaxed that it’s good for their joints. Plus although I’ve not tried it yet all the covers are removable and washable, which is ideal for mucky dogs! One of the best dog products I’ve bought this year! Especially this time of year my dogs seem to have the mud washed off at least once a day [Often 2 or 3]. So understandably we go through a lot of towels. However earlier in 2018 we tried our first microfibre towel from Paws & Presto, a company who have since released more dog products and we’re love watching them grow! We wrote a blog post all about the towels here. What’s so great about the microfibre towels is that they absorb SO much water, but they’re not sopping wet and then also dry really quickly ready for round two. You can buy them online here, but also why not follow Paws & Presto on social media to keep up with any new releases. Probably the biggest change of 2018 with my dogs was the switch over to RAW food, and it was the best thing I did! There was nothing wrong with their old food [Guru] as they adored it, it was such great quality and really good for your dogs. We had been on Guru right from the start for 3 years, as well as being GeekSTARs & we love the Guru girls so much. But the next step up from Cold pressed food is RAW. So with all the help and guidance from Cotswold RAW we switched straight over to RAW for the next meal, and of course the dogs LOVED it. I’ve written a few RAW blog posts through the year, 1 month on RAW & also a RAW feeding Q & A which is really helpful for any newbies like I was. 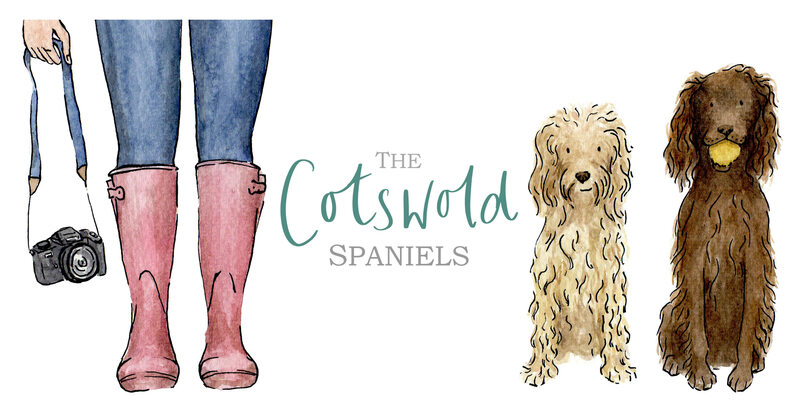 Cotswold RAW is the best quality RAW completes I’ve come across, & the spaniels are absolutely thriving on it, plus the Cotswold RAW team are so lovely and will help you with any queries you have! And when we’re travelling I swap straight back to Guru as Cold Pressed is good to feed when you can’t bring RAW. One of my favourite gadgets this year is the Furbo Dog Camera. It puts my mind at ease when I go out that I can check up on the dogs to see what they’re up to. I’ve also written a blog post about the camera here, it can also throw them treats, has night vision and my favourite bit: alerts you when they’re barking, so I always know when the postman has been. Having moved the dogs onto RAW food this year I’ve been much more aware of which chews and treats I give them and what is good for them. Harley Hounds post out natural chews and treats at such good low prices but still good quality products. Although you can’t order on their website you just message on their Facebook or Instagram to ask a question or place an order. You can choose big bags of particular chews, or there’s selection boxes with a nice range of chews to try if you’d like a variety. I have such a big collection of dog collars and leads from so many talented companies, I just can’t help treating the dogs to a new outfit. But one of my favourites that I bought this year was Wilma’s Rainbow collar from Devil Dood Designs. I’ve bought lots of accessories from Emily in the past and they’re always so well made, plus excellent customer service. The great thing about paracord collars is when they get muddy you can just pop them in the washing machine and they come out looking brand new. But I went for the added Biothane meaning the collar could also be adjustable. Whenever Wilma is out wearing it she always gets comments on how pretty it is. It stands out [For a good reason] & I love the pastel rainbow colours. To order this is the cobra style then you can add the rainbow option. But any questions just send Emily a message to make sure you get the right size and colours. Another company I only discovered this year is The Dog and I, but is someone I will use and recommend forever. Never before have I seen shampoo in soap bar form but I just love them. It makes it so easy at bath time just rubbing the bar all over the dogs. Made up of all natural ingredients they smell amazing but are also safe for your dogs and the environment. Plus they last such a long time. As well as the soap bars, Keri has cologne to freshen up your dogs when there’s no time for a bath, and detangling spray for those fluffy dogs. We’ve so many more products we could list but we’d be here until 2020! We hope you have a wonderful 2019 & maybe you’ll try out one of our favourites.